Brite Glass is your locally owned full service glass shop, in business since 1990. 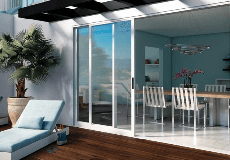 We proudly offer Milgard windows and doors! We don't use sales pitches or gimmicks and won't pressure you. We sincerely enjoy assisting our customers in creating their perfect space by focusing on their unique needs. We look forward to giving you the creative and technical tools to make the perfect decisions for you and your project! Reno, Sparks, North Valleys, Carson City, Minden, Gardnerville, Incline, South Lake Tahoe, Tahoe City, Tahoe Vista, Truckee, Tahoe Donner, Virginia City, Fallon, Fernley, Spanish Springs. Brite Glass, Inc. is rated 5.0 out of 5 by 3. Rated 5 out of 5 by Rozy49 from Windows and more Brite Glass replaced all of the windows in my house. The product is beautiful. the windows are very smart looking and excellent quality. I hadn't realized just how horrible the old ones were; they were the originals that came with the house 30 years ago) . I was impressed with the customer service, the sensitivity to personal needs and patience demonstrated by everyone. Wonderful people to work with. Rated 5 out of 5 by Gail E from Excellent product and terrific company T have a custom MCM home which presented several challenges for window replacement. Brite Glass worked with me to tackle each one successfully. They followed up to make sure everything was done appropriately. I am very satisfied with the result. Rated 5 out of 5 by Whitescreek from A truly professional staff, great service and awesome design advise for my clients! Our company has used Milgard products on multiple new and remodel construction projects. We have installed all types/styles of their windows and doors and always are pleased with the product! We have had only a couple of very minor call backs and were extremely pleased with the rapid response from both Brite Glass and Milgard to handle our needs. Our customers of all been very satisfied with the performance of the Milgard products. The staff at Brite Glass is the most professional I have found in our area. Extremely knowledgeable about product and what products work best for the type of project we build. We highly recommend Brite Glass for all window, door, mirror and shower door products and installations.